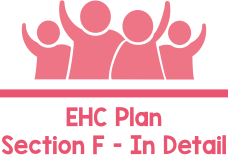 This EHC Plan workshop focuses on section F of the plan. An education, health and care plan is for children and young people, between birth and 25, and is the result of a 20 week statutory assessment of the child/young persons needs, and the special educational provision required to meet them. Designed exclusively for BPC by Cheryl Wyatt from the Information & Advisory Service (IAS) Bolton, our workshop has been designed to give parents and carers an in-depth understanding of the part of the EHC plan that covers the SEN provision that must be delivered for your child or young person. Section F is where the SEN provision for your child or young person is listed. It must detail all the additional provision and how it must be delivered and when, therefore it is a vital part of your child or young person’s plan. Our workshop explains how section F fits with the other sections of the plan and how it is written up. We give you the skills to read your child/young person’s plan and fully understand the provision that must be happening and how you can discuss this with the educational setting. We cover annual reviews, which must take place annually and can be used to review the delivery of provision listed in section F.
This workshop is ideal for parents and carers who have a relatively new plan, however it is useful for any parent or carer wanting to increase their understanding of EHC Plans. The workshop lasts for 2 hours, with built in breaks and refreshments. It is a relaxed atmosphere and we ensure there is ample time to ask questions. Everyone who attends receives a handout to take home that details the key aspects we have covered. To book a place on any of the above sessions, please complete the form below.